Irish Champion Trainer Willie Mullins has confirmed that stable stars Benie Des Dieux, Faugheen and Melon are set not only to take each other on, but remain on course to attempt to outmuscle and outmind Buveur D'Air in the Aintree Hurdle on Thursday. If all three turn up for Mullins, they will all have a reason to improve and build on their performances at the Cheltenham Festival last month - aside from Nicky Henderson's dual Champion Hurdler, who will look to respond himself after falling at hurdle number three when going for the hat-trick. Firstly, Benie Des Dieux - arguably the unluckiest of them all, fell at the final flight in the Mares Hurdle when appearing to have the race at her mercy. Melon finished a tired but good second to Espoir D'Allen in the Champion Hurdle, whilst Faugheen rediscovered a better touch to finish a satisfactory third to Paisley Park in the Stayers. Speaking on Sunday, Mullins was keen on running all three in the same race. (Credit: Racing Post) He said: "All three are fit and well and ready to run. All three could be on the ferry on Tuesday morning and, at the moment, they are all running. It is nicely timed between now and Punchestown. "We can't say that Benie Des Dieux has had a hard season so she's able to run. An extra half-mile is what Melon looks like he wants and Faugheen will have no problem with the trip and the ground. "The only problem would be if the ground keeps drying up. That might be an issue for Benie, but the other two will be fine on the ground so they're good to go." Mullins' has put the emphasis on quality over quantity, after his squad appears to be much more select than old rival Gordon Elliott's - who could saddle as many as twelve in the big race itself; the Randox Health Grand National. 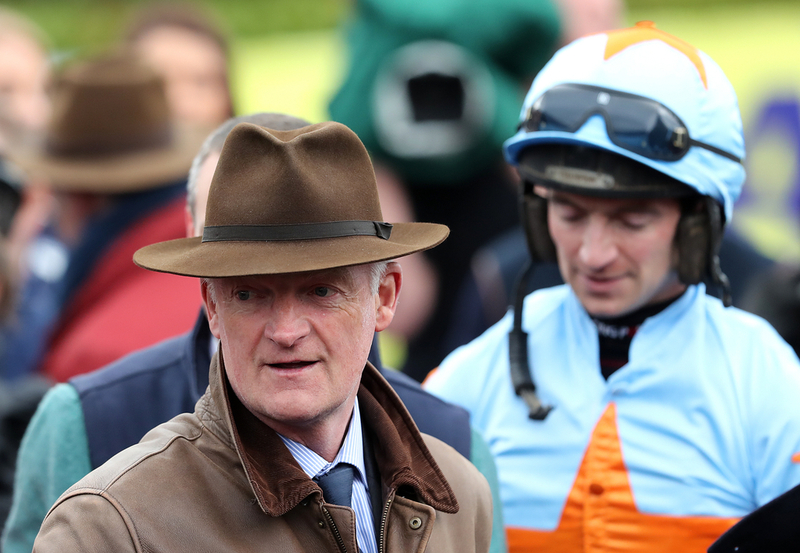 Mullins added: "Cadmium will run in the Topham, along with Polidam, and I would say Aramon might turn up in the 2m novice hurdle on Friday [Betway Top Novices' Hurdle] but I won't have too many others and not many for the handicaps either." The race could also see the return of last year's Supreme Novice victor Summerville Boy - who's two runs this season have been blamed on a hairline fracture of his off-hind leg, which has kept him of the track since December. Trainer Tom George is hopeful he can rekindle the love with punters, and stated that his recovery has gone well. (Credit: Racing Post) George said: "He’s had a good recovery, it’s all gone to plan as we’d hoped. He was never properly out of work, we just had to ease off with him, so it wasn’t like we had to stop completely. "We kept him ticking over, but he had to go on to light work rather than proper hard work. He’s through all of that and we’ve stepped it up over the last eight weeks. He’s in good order and ready to go." Apple's Jade and Samcro are two notable inclusions for Gigginstown, so we could be set for an absolute cracker.